Let us tell you why we think the Meade Instruments 216006 Polaris 130 EQ Reflector Telescope is a great fit for all beginner astronomers. First of all, there is the legendary quality, and precision of all Meade Instruments telescopes. Then, there’s the concern for choosing the right optical tool when you’re just beginning your sky observations. A beginners’ telescope should not be too expensive, as you don’t know if you’ll stay committed to this new hobby. However, a beginner’s telescope should be well performing, to give you a taste of high quality astronomy. The Meade Instruments 216006 Polaris 130 EQ Reflector telescope sports a famous name, and a cheap price. We will analyze its features, pros and cons, and performance to give you a complete review. What is the Meade Instruments 216006 Polaris 130 EQ Reflector Telescope? The Meade Instruments 216006 Polaris 130 EQ Reflector Telescope will deliver a great user-experience to astronomy beginners. This Polaris telescope combines outstanding optics with an equatorial mount, to guarantee crisp-clear images. The large manual German Equatorial mount features a slow motion control for a smooth tracking and focusing on celestial objects while they are in motion. The mount is larger than the ones in similar products, and is very stable. The Meade Instruments 216006 Polaris 130 EQ Reflector Telescope comes together with a stainless steel three-legged tripod. This tripod is sturdy and steady, but also incredibly lightweight. There is also an accessory tray that makes the whole ensemble easy to set up and organize. As equatorial telescopes go, this Polaris telescope clearly takes the cake. It is easy to transport to fields, camping trips and high altitude observation points. You can use it at its full potential in non light-polluted areas. To top it all, this Meade Polaris telescope series model also comes together with an Autostar Suite Astronomyplanetarium DVD, which contains over 10,000 celestial objects. If you’re taking an Astronomy class or you’re just having fun with the kids, the DVD will open up a new world of celestial wonders, and lessons. Meade Instruments 216006 Polaris 130 EQ Reflector Telescope price makes it win in any competition among similar products. Sometimes the Barlow lenses lead to mild chromatic aberrations, especially when gazing at the Moon. 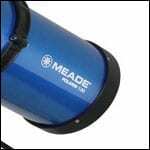 Where to Find the Meade Instruments 216006 Polaris 130 EQ Reflector Telescope? 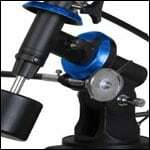 Usually, you can find the best Meade telescopes for sale on Amazon. 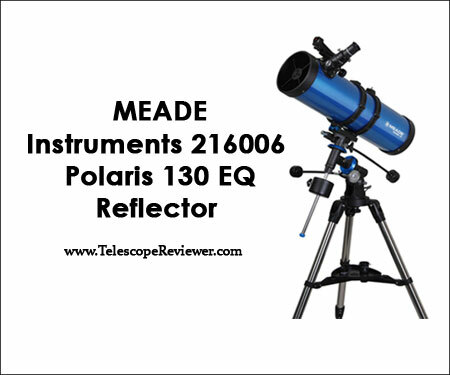 If you are wondering about the Meade Instruments 216006 Polaris 130 EQ Reflector Telescope price, you can find it at around $200.00. You have to admit, it’s a bargain, considering the high quality of this product. As beginner astronomers, gifts, children’s hobbies or introductory Astronomy classes go, this telescope covers all these needs and wishes. 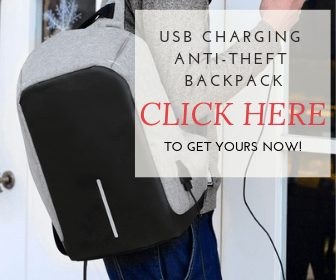 Very affordable for such a good product, the price is more than convincing. 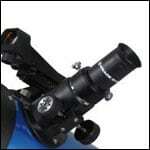 It is hard to compete with this telescope in the beginner telescopes niche. If you want to compare it with other scopes in the same price range, you can take a look at the best telescopes under 200. As this is a Meade Instruments series product, first and foremost we will look into its aperture. At 130 mm (5.1 in), you can say this beginner telescope is perfect for night viewings of celestial objects. The Moon, planets and stars are just the beginning. The three 1.25 inch eyepieces (26 mm, 9 mm, 6.3 mm) offer you the possibility of deep sky gazing. Nebulas, star clusters and galaxies may be within your eye reach. The extra benefit of having a red dot view finder makes it easy for everyone to spot celestial objects, and see them in bright light and crystal clear images. The 2x Barlow lenses and the three magnification options (low, medium and high) are excellent tech specs for such a cheap product. Moreover, collimation becomes incredibly easy when you set the whole system correctly. In terms of optics, the best Meade telescopes come with great focal lengths and focal ratios. This Meade 216006 Polaris 130 equatorial reflector telescope makes no exception. It sports a 650 mm focal length and a f/5 focal ratio which add to the qualities of this Meade Instruments Polaris 130 EQ Reflector telescope. More on the optics side of things, let’s not forget that the Meade Instruments 216006 Polaris 130 EQ Reflector Telescope also boasts anti reflections multi coated lenses for the best possible viewings. The 130 mm silicon dioxide coated mirror prevents all light reflectivity, which is great for obtaining crisp images. The accessory tray of the Meade Instruments 216006 Polaris 130 EQ Reflector Telescope allows you to organize and keep the product relatively safe and well organized. Keep in mind to have the telescope safe from dust, humidity, direct sunlight and, mechanical accidents. Clean the lenses with microfiber cloths, and transport it with care. There are plenty of accessories that are available for this telescope, including special eyepieces and filters for different stars and planets viewings. Meade offers a one–year warranty for the Meade Instruments 216006 Polaris 130 EQ Reflector Telescope. This includes standard warranty operations in the boundaries of normal wear and tear. It is rare to find a telescope that comes together with a steady, sturdy tripod, a large manual German Equatorial mount, an almost perfect collimation, three eyepieces and a proficient finderscope, all in the same package. This is perhaps one of the best and most affordable beginner telescopes on the market. You can watch a Meade Instruments 216006 Polaris 130 EQ Reflector Telescope YouTube presentation in order to take a better look at the product’s features. All in all, this telescope is impressive by both quality and price. It is even great to look at, not only through it. 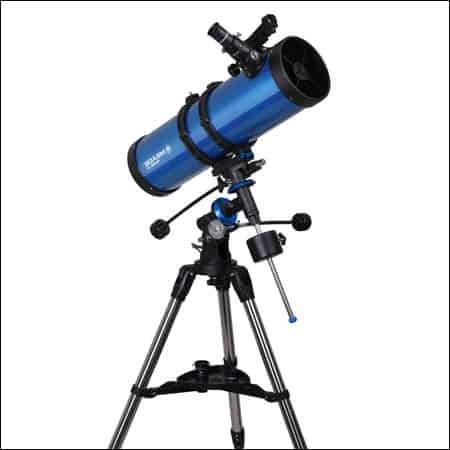 The sturdiness, the high quality of all components, the crisp, crystal clear images, and the portability of the telescope make us recommend it to all new Astronomy fans. It is great for kids and their parents, and it will keep you busy for months in a row. A perfect grab-and-go, the telescope makes it even on uneven surfaces (fields, mountains). We couldn’t be happier with the Meade Polaris 130 EQ Reflector Telescope for a beginner and intermediate level astronomer. For all these reasons, we wholeheartedly recommend it.